IAM/TCU President Bob Scardelletti holds up his winning ticket in the drawing for a 2012 Bombardier Can-Am Roadster. Scardelletti then donated the three-wheeled motorcycle back to the Grand Lodge Host Committee to be raffled off again. More than 300 delegates and guests at the 2011 MNPL Planning Committee Meeting in Albuquerque, NM held their breath as IAM President Tom Buffenbarger called out the winning number in a drawing for the 2012 Bombardier Can-Am Roadster RT. 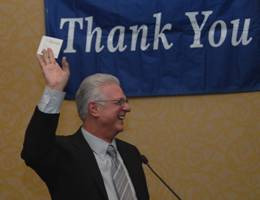 The winning ticket holder, TCU/IAM International President Robert A. Scardelletti , got a prolonged standing ovation when he announced he would donate the union-made motorcycle, known as the Spyder, back to the Convention Host Committee to become the prize for an additional fundraising drawing. Prior to the drawing, Canadian GVP Dave Ritchie announced that the Harley-Davidson had just agreed to donate a second IAM-made motorcycle to benefit the 2012 Grand Lodge Convention fundraising effort.